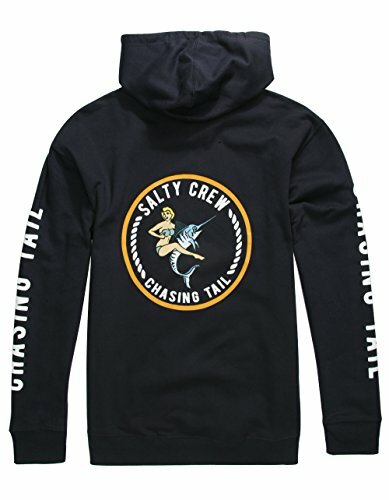 Salty Crew Salty Sally fleece pullover hoodie. Salty Crew pin up girl graphic screened at left chest with larger version screened on back. Kangaroo pocket. Long sleeves with "Chasing Tail" screening. Lined drawstring hood with tag. Ribbed cuffs and hem. 80% cotton/20% polyester. Machine wash. Imported. If you have any questions about this product by Salty Crew, contact us by completing and submitting the form below. If you are looking for a specif part number, please include it with your message.